In a massive coming together of Pandora's Kharis members, we have raised $ 135,- (€ 122,-) for our democratically decided upon cause, Sea-Watch. As always, you have all given generously, and in the spirit of the Gods! Since the year 2000 more than 23.000 people have died trying to reach Europe’s shores. 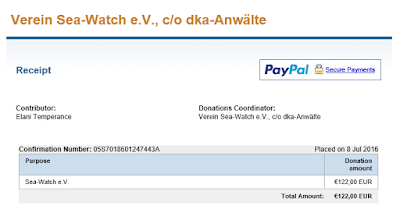 Three business partners from Germany decided to found the non-profit NGO Sea-Watch e.V. in an effort to bring down those numbers. Since November 2015 Sea-Watch is working between Lesbos and the Turkish mainland to prevent further deaths in this part of the Mediterranean Sea, recording the highest number of drowned refugees in 2015. From this moment on, the Pandora's Kharis Facebook page is open to pitches. If you do not have Facebook, feel free to pitch your cause in the comments. We will relay the message to the community. Please pitch your cause before July 15th. On to another month of pitching, voting, and giving. Thank you for your generosity!